Empower users to get the most current information. Increase efficiency and reduce costs. In a matter of minutes you will be generating reports from GE Digital Historian, Wonderware Historian, DeltaV Continuous and Batch historians, Rockwell Software FactoryTalk Historian, Kepware KEPServerEX Local Historian, Canary Labs Enterprise Historian, any OPC HDA server and more. 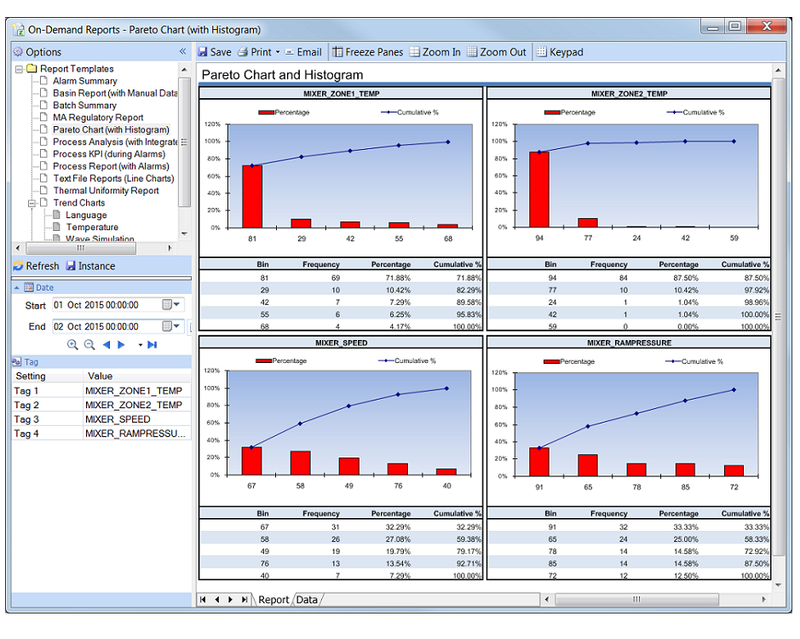 On-demand reports and dashboards provide users with the capability to drive reports to their workstation. Template parameters, such as start/end dates, tag names, batch ID, alarm thresholds and filters determine the content of the report. Use from a standalone wokstation, HMI/SCADA display and clients across the network. Retrieve raw values, summary values and industry specific metrics without connecting directly to the data source. 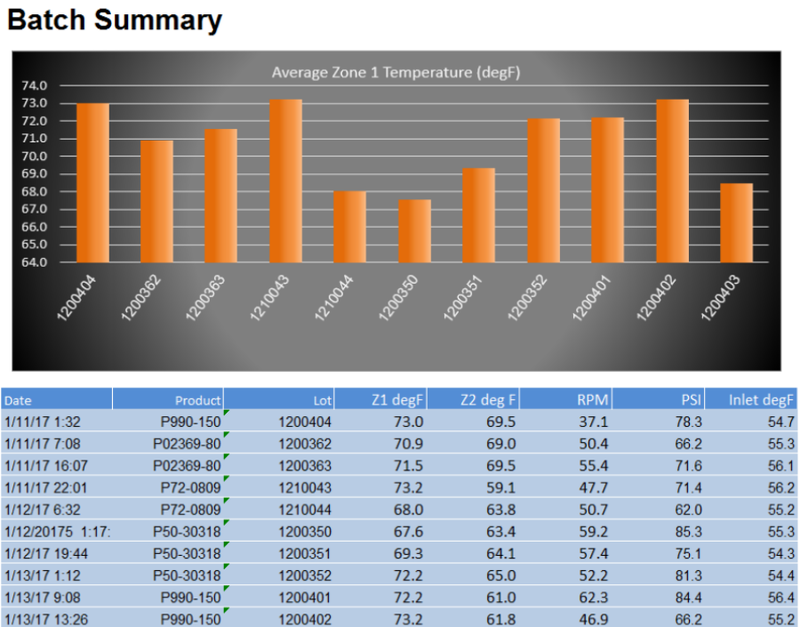 Provide drill-down and searching features using custom report parameters. User credentials ensure that each person only has access to their reports. Add supplementary information such as comments and signatures. 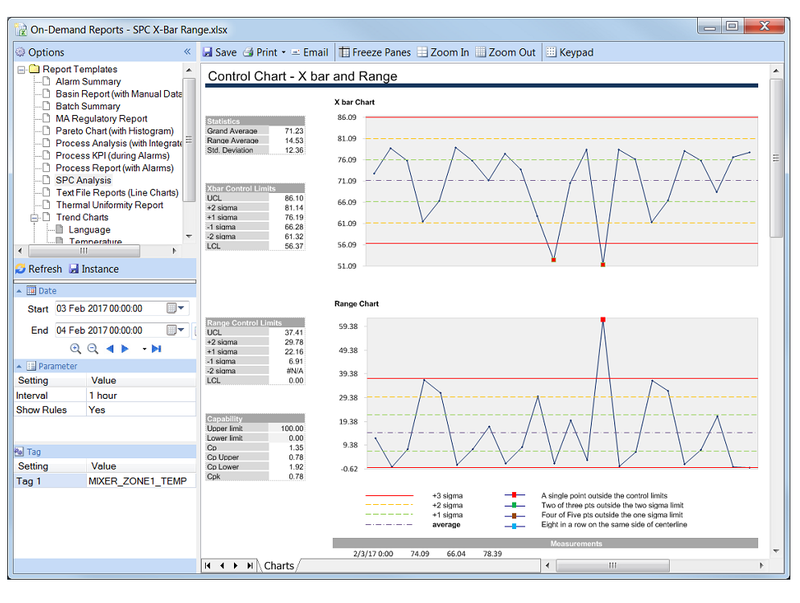 Live dashboards update automatically with a new report providing the user with up-to-date information on any data source supported by XLReporter. The rate of update is selectable. 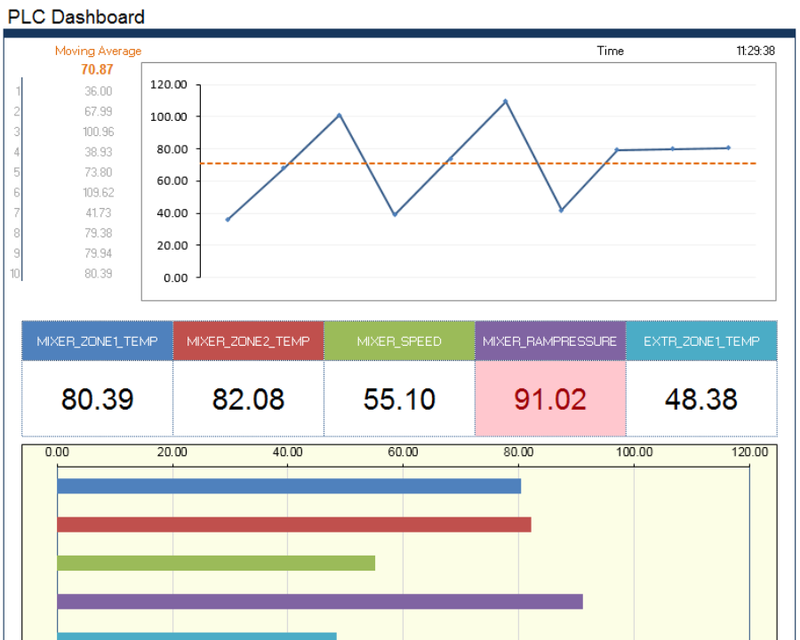 Dashboards are ideal for projecting reports onto large monitors. Understanding and rectifying alarms is essential to maintaining an efficient process. 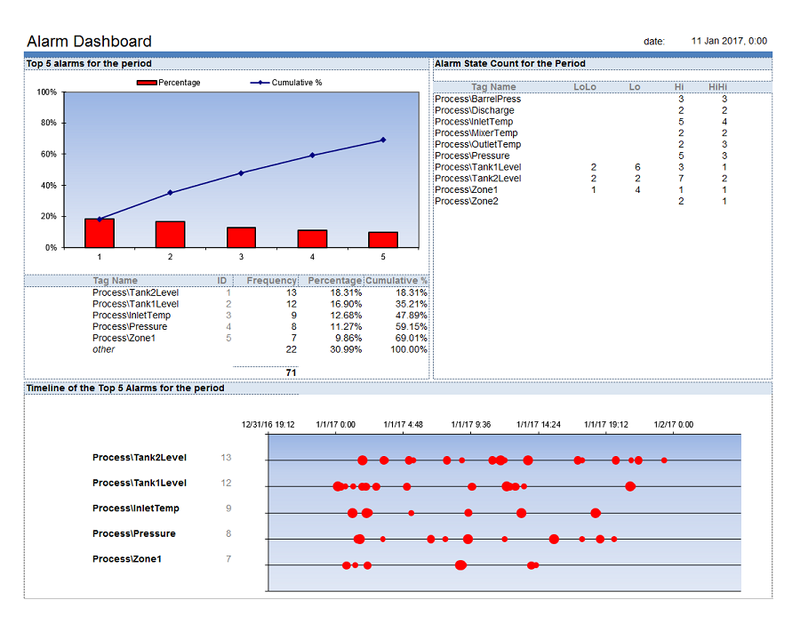 In this solution, the most active alarms are displayed in a pareto chart clearly showing the problematic parts of the process. A second chart shows the same alarms in "swimming lanes" with the severity of the alarm state shown by the size of the bubble. The effect of alarms on product quality may not be critical as long as it can be validated that the process stayed in control during the period of the alarm. 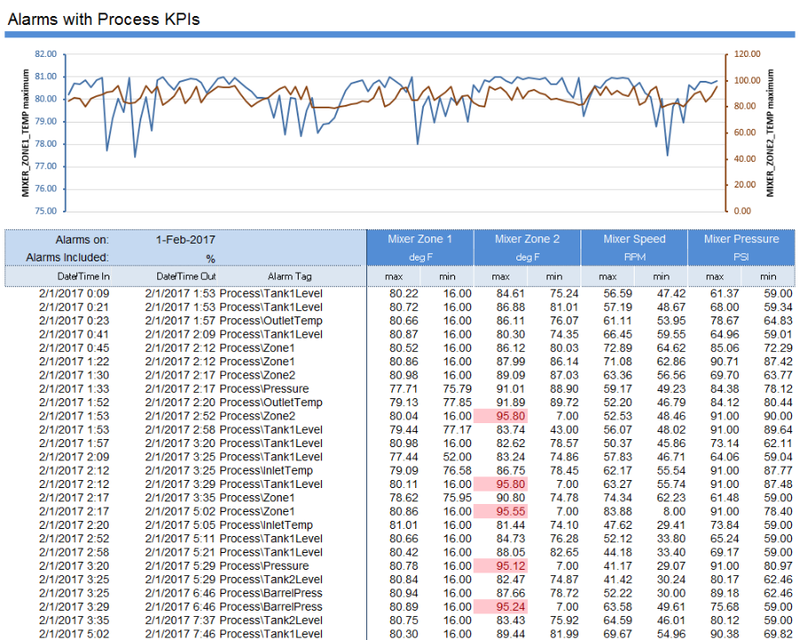 In this solution, the minimum and maximum of key process indicators are calculated for each alarm that occurred over the report period. In other words, the minimum and maximum values are calculated for each alarm from the time it was set to time when it cleared. Discrete reports e.g., machine cycle report or batch report, from a continuous historian are only possible if the start and end of the timeperiod are retained so that they can be used for the data retrieval. In this solution, batch reports are produced by "bookmarking" the start and end of a batch, togther with other information such as the batch number or product code. In this way, reports are created by selecting the batch number instead of specifying a timeframe. Create a report for each batch for easy comparison and produce a summary over multiple batches.